After the family ate lunch, Wei Luo went with fourth madam to the reception pavilion to talk for a while, then she went to first branch’s Banyan Tree Courtyard with Liang Yu Rong. 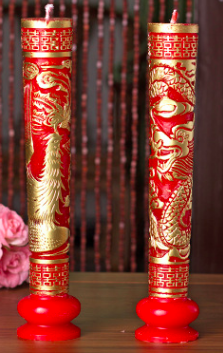 There were still leftover bright red paper cutouts of the “double happiness” from the wedding day. The lanterns in the verandah also hadn’t been taken down yet. Wei Luo pursed her lips and laughed. She grandiosely walked into the inner room. The inner room had a twelve piece red sandalwood divider that was decoratively carved with lotus flowers. Behind the divider, there was all of the furniture that the newlyweds would need. The tips of Liang Yu Rong’s ears turned red. Without saying a word, she led Wei Luo to sit down on a couch by the window and pretended that she didn’t hear her question. Liang Yu Rong wasn’t a person that was easily embarrassed, but her young girl’s heart had been fully appeared after she had recently married the person she loved. Her shy and embarrassed appearance made her looked much cuter than normal. No wonder Wei Luo couldn’t resist teasing her. That night, it had been the first time for the both of them. There were bound to be mishaps. Since Wei Chang Ying’s leg wasn’t fully recovered, he guided her to complete the wedding night with his words. As his quiet and hoarse voice entered her ears, Liang Yu Rong felt as if her brains were turning into a tangled mess. She couldn’t think of anything. She even forgot about the booklet that her mother had given her the night before the wedding. She could only follow Wei Chang Yin’s words. Whatever words he said, she obediently did them. Wei Chang Yin wrapped his arms around her shoulders. This was the first time that he realized this girl was so slim and frail. Feeling heartache, he kissed her forehead, “I’m sorry…” But, he didn’t say he wanted to stop. All women had to experience this. Since she had married him, he wanted to give her everything a wife would have. He didn't want other people to think badly of her. His leg was his only injured part. The other parts were perfectly fine. When Liang Yu Rong went to greet her father-in-law and mother-in-law the next day, her sore legs felt completely lacking in strength and she even felt embarrassed every time she looked at Wei Chang Yin. Two days later, she gradually became more comfortable. Right after Wei Luo said, “Okay,” Liang Yu Rong disappeared like a wisp of smoke.